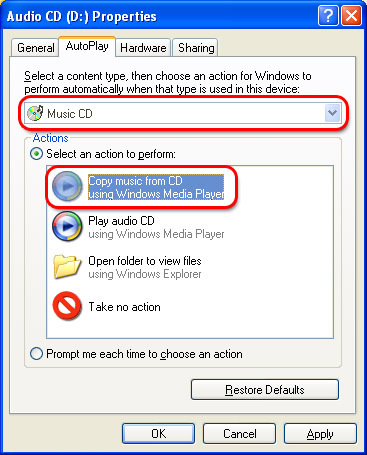 Our step-by-step guide shows how making MP3s from your CDs is convenient and easy with	Windows Media Player. This article will show you how to	rip your CDs without pressing a single key. 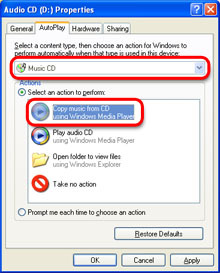 After following these steps, any time you insert an	audio CD into your computer, Windows Media Player will automatically copy	it to thelibrary	on your hard drive. If the CD has already been copied,	it will let you know. Before getting started, make sure you have configured Windows Media Player for CD ripping by	following the Knowzy step-by-step guide. The first step is to tell Windows what to do when an	audio CD is inserted into your CD-ROM drive. This is	done by changing your AutoPlay setting for the CD-ROM	drive. If you have more than one drive, you can make this	change to all of them or you can designate one of your	drives to be your CD ripping drive. It doesn't matter if your drive is a CD-ROM, a	DVD-ROM, a CD burner or a DVD burner. All are capable of	ripping audio CDs. Right-click your	CD-ROM drive and click "Properties..." to bring	up the AutoPlay settings for the drive. Let's get to it! First, bring up "My Computer" (found on the Start	Menu). Next, right click the CD-ROM drive. This will	bring up a menu. Click "Properties..." on the menu. Now	select the "AutoPlay" tab to configure the action to	take when an music CD is inserted. Choose "Music CD"	from the dropdown list and select "Copy Music	from CD." In the AutoPlay tab of the CD-ROM Properties	window, choose "Music CD" from the dropdown list at the	top. Look closely: The default is "Music Files" and	that's the wrong choice! Now click the "Select an action to perform" radio	button. This will enable the choices below it. Finally,	select "Copy Music from CD" and click the "OK" button. You have now configured Windows to automatically rip	audio CDs to your hard drive. But you're still not quite	done. If you want truly automatic audio CD ripping, there are	two more settings to configure. Start Windows Media Player and select the "Options..." menu item from the "Tools" menu. This will	bring up the Options dialog box. Select the "Rip Music"	tab and you should see the settings below. Check "Rip CD when	Inserted" and, optionally, "Eject CD when	ripping is complete." 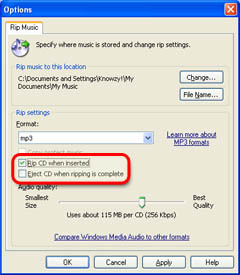 The "Rip CD when inserted" checkbox tells Windows	Media Player that to automatically rip audio CDs when it	is running. How is that different from changing the AutoPlay	setting in the first step, you ask? When Rip CD when	inserted setting is off, if	Windows Media Player is already running when you insert	an audio CD, nothing will happen. This is especially	noticeable when ripping several CDs in a row. The other setting to consider is "Eject CD when	ripping is complete." This is a handy way to know when	Windows Media Player is done with your CD: the door to	the CD-ROM drive will open automatically. If you turn this setting on, don't set your drink in	front of the CD-ROM drive. I learned this one the hard	way! Your PC is now an automatic CD ripping machine. Here's to your budding MP3 collection!